While making 1960's The Apartment in New York City, Director Billy Wilder was staying near the United Nations. He witnessed the cold war hubbub surrounding the place and one day asked his collaborator I. A. L. Diamond, "Do you think it would be funny to do a picture with the Marx Brothers at the United Nations?" "We want to make a satire on the conditions of the world today, a satire on the deterioration of diplomatic behavior, on brinksmanship, wild jokes about the H-bomb, that type of stuff. It's all so dramatic that a few jokes put over by the Marx Bros. should alleviate the tension. We might have the Marx Bros. mixing up all the flags with, say, Nasser coming in under the Star of David. Mad fun like that. We will keep the same Marx Bros. technique of playing against a very serious background. We'll try to keep it all - the dignity of the locale, the procedure, the enormity of the problem - with Groucho, Harpo, and Chico in the middle of it. It's fun and it involves the world as a whole. It will be understood universally, therefore it's worth a film. Making a film is like gambling with the chips getting more expensive every day. That way you can't afford too big a gamble. 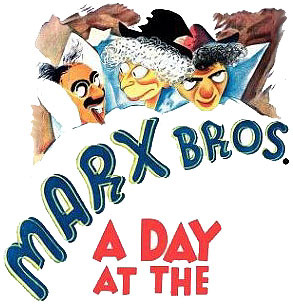 So we've got the UN and we've got the Marx Bros. Put them together, and - boom!". But age and infirmity crept in. Harpo had a heart attack while rehearsing for a TV special and though his health improved they were unable to get insurance for the project. Shortly thereafter Chico died, so neither Wilder nor the moviegoing audience got to enjoy the Marx Brothers spending a day at the UN.